During your analysis whether you are working manually or in QDA software package you will need to create new folders to store your data. double click the My Computer icon. 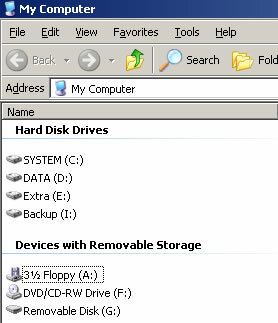 See Figure 1.
click the Drive where the folder is to be saved. See Figure 2. Locate where in the folder hierarchy the new folder will be located. double click the folder you want to create the new folder within. A new folder appears with the name 'new folder' highlighted so you can type in a new name for the folder that is meaningful to you. The resources on this site by Graham R Gibbs, Dawn Clarke, Celia Taylor, Christina Silver and Ann Lewins are licensed under a Creative Commons Attribution-NonCommercial-ShareAlike 3.0 Unported License. Technical maintenance by Andrew Teal.